The aftermath of a terrible oil spill in Santa Barbara 46 years ago is still affecting L.A. shorelines, reports Heal the Bay vice president Sarah Sikich. Today the state’s environmental community is solemnly remembering a regional environmental disaster of unprecedented proportions – the Santa Barbara oil spill. The vibrancy of Santa Barbara’s coastline is so striking, which is why the tragic events of 1969 still stain the minds of so many Californians. The years I spent living in Santa Barbara in the early 2000s were the closest I’ve come to my career goal of living fully as a beach bum. I threw myself into the ocean – both literally and figuratively. I studied Coastal and Marine Resources Management at UCSB’s Bren School, paddled outriggers for Ocean Club, served as a Board Member for the Coastal Fund and worked summers at Santa Barbara Sailing Center. Few memories top the sunsets at Mesa Lane beach, the world-class surf at Rincon (and other spots that shall not be mentioned) or being greeted by gray whales during early morning outrigger practice. 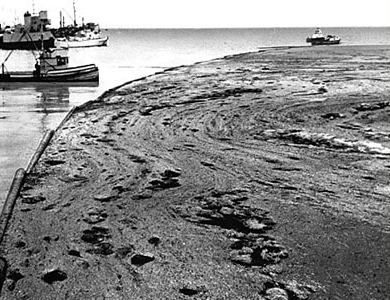 But 46 years ago today, an environmental disaster of unprecedented proportions rocked the Santa Barbara coastline. On January 28, 1969, about five miles off the Southern California coast, a blow-out occurred on Union Oil’s Platform A, spewing an estimated 3 million gallons of crude oil into the Santa Barbara Channel and fouling beaches from Goleta to Ventura and across to the rugged Channel Islands. Thousands of birds were killed, and numerous ocean wildlife, including sea lions, elephant seals and fish perished. The blow-out also took an economic toll on the community. Commercial fishing was temporarily suspended, tourism suffered and coastal properties bore considerable damage. This catastrophe remains the third-largest oil spill in U.S. history after Deepwater Horizon and Exxon Valdez. It also helped spark several environmental laws and policies, including the Clean Water Act, the National Environmental Policy Act and the California Coastal Commission, and laid the foundation for the modern environmental movement. Nearly five decades removed, we are still faced with environmental threats associated with oil drilling along our coast. Although California has retired all but one of its outdated and risky offshore marine terminals, Santa Monica Bay is home to California’s last remaining offshore marine terminal, built in 1911, which services more than 300 tankers each year. 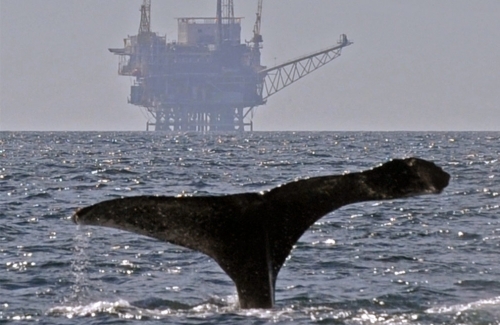 Meanwhile, dozens of oil rigs dot the waters off California’s coast. One by one, these offshore oil drilling platforms are also being decommissioned in California. But emerging oil drilling projects pose a new threat to our beaches. Although new offshore drilling is prohibited in our state and federal waters, oil companies continue to seek ways to access oil fields underneath the seafloor. We are feeling that threat right here in Santa Monica Bay, through pursuit of a slant-drilling project to access oil under the Hermosa Beach seafloor by an oil company called E&B Natural Resources Corp. And, it’s up to Hermosa voters – a community that has stood up to big oil for decades – to decide whether or not to allow this oil drilling operation through a special election ballot measure. On March 3, Hermosans will vote on Measure O, electing whether to maintain the existing moratorium on oil drilling or to repeal that ban and allow E&B Natural Resources to pursue its proposed 34-well, up-to-30-year drilling operation. 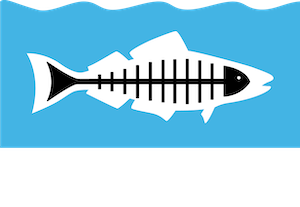 Throughout February, Heal the Bay will be in the Hermosa community to educate voters about the risks associated with oil drilling. You can come join us on February 7 for a beach clean-up and Pop-Up Pep Rally at Becker Surfboards in Hermosa and for an environmental forum on February 12 featuring remarks by long-standing environmental advocates Ed Begley, Jr. and Bobby Kennedy, Jr. Heal the Bay has also partnered with NRDC to produce a report evaluating the risk of oil drilling to Santa Monica Bay, which outlines the legal protections against and vulnerabilities to oil drilling along the Bay. Big Oil is slick. And, it has deep pockets. Local communities must be vigilant in standing up for the environment and public health, and show solidarity when neighboring cities are suffering from proposals to drill. We applaud the City of Santa Monica for adopting a resolution opposing Measure O last month. We hope that by continuing to stand up against Big Oil in their own communities, individuals and local municipalities will encourage Hermosans to keep their ban on oil drilling. Find out more about how to get involved on the Take Part page of our website.